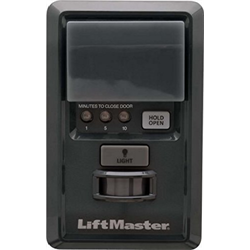 The Liftmaster 881LM motion-detecting control panel comes with a timer-to-close option that can be programmed to have the garage door automatically close after a pre-programmed number of minutes. Conveniently have the door close after you leave the garage and never worry about having it left open when you’re away. The control panel features a large illuminated push button so you can close your garage door with ease even in pitch black and night. The built-in motion detector with a 150-degree sensing angle will turn the lights on when movement is sensed. The lights can also be programmed to turn off after a certain amount of time when the garage door has been locked so you don’t have to worry about everything going dark in the evening when you’re attempting to get out of the car with groceries. Note: The 881LM is only compatible with Security +2.0 garage door opener systems.